It was a sunny summer morning. By communicating through email and phone, we had no idea what each other looked like. Fortunately, it turned out all right. We met and took a brief walk through the plaza, and found a paseo with park benches and shaded arcades to sit and talk. It was an interesting process. My Spanish is pretty good, but for the interview I had to speak and listen in Spanish, then write simultaneous notes in English. This was as challenging as a sparring match! I had to test my mental interruptability and flow. I recorded the interview with sifu Luis Ramos, but it turns out listening to a long audio recording with background noise, and later having to find nuggets of information within the recording proved to be challenging, too. The first thing that struck me about sifu Luis Ramos was when he explained his style of Wing Chun; he made it very clear that his was different, but not better than other Wing Chun lineages. This comment set me at ease. It's common to get into “my lineage is better than your lineage” type discussions or “my sifu is better than your sifu”. This was not the case with sifu Luis. His grandmaster was Choy Fong Lum and his direct sifu was Ivan Uehara. Sifu Luis trained Wing Chun since he was 20 years old, with 7 years directly under Ivan Uehara. Sifu Uehara moved away from Peru to Japan many years ago. However, when he taught in Peru, he followed the old style. Sifu Luis Ramos had to carry bricks, tree trunks, and suffer other forms of strict physical strength training and conditioning. Sifu Uehara’s attitude was: if you don’t want to do it, you can leave. Wing Chun has Hung Gar in it? I was a bit shocked when sifu Luis Ramos revealed that. I asked him to repeat it to make sure I understood him correctly. 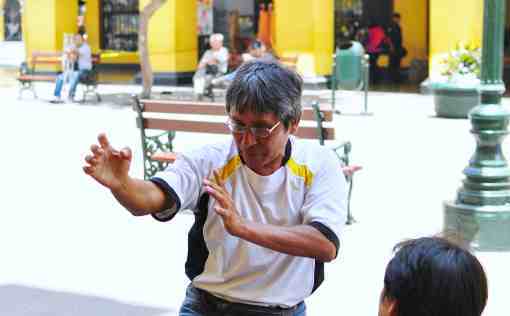 Sifu Luis said, “Originally, Wing Chun had a lot of Hung Gar.” This has led to some debate within Peru. The critics argue his style of Wing Chun is not pure because it's mixed with Hung Gar. The most common legend of Wing Chun’s origin is that it rose from the ashes of the burned down Southern Shaolin Temple. The nun, Ng Mui, safely escaped from the devastation and taught her own form of Kung Fu (adapted for a female-sized body) to a Ms. Yim Wing Chun, which is where the art is believed to get its name. It’s widely accepted that Wing Chun took the best of the major Kung Fu styles at the time, kept the most efficient and effective moves, and turned it into Wing Chun. Iron palm and iron shin training could actually be inspired and come from Hung Gar’s brutal training methods. Also, the best I could tell from Kung Fu history (which we know is not fully documented or accurate), Hung Gar is older than Wing Chun. It turns out, the Hung Gar grandmasters were hiding and training inside the Southern Shaolin Temple in opposition to the then empire... before the temple was burned down by the imperial army. So yes, it is quite possible that Wing Chun, especially early on, had a lot of influence from Hung Gar. On top of all that, in Southern China (Guangdong, Fujian, etc.) Hung Gar was (and is) equally popular, or more popular than Wing Chun -- especially before many Wing Chun grandmasters started leaving China during China’s crap period** to places like Hong Kong, Peru, USA, Europe, Australia, etc. (** China's crap period in modern history: Starting from the fall of the last empire in the late 1800s/early 1900s; European/American/Japanese colonialism through most of the early to mid 1900s; followed or punctuated by Chinese warlords, KMT-Communist Civil War, and Cultural Revolution that lasted to the mid-1900s. In total, almost a 100 year nonstop nightmare. China didn't start to turn the corner until the 1980s when Deng Xiaoping started to adopt more Free Market Capitalism. Today sifu Luis Ramos teaches both Wing Chun and Hung Gar to a very small group of private and dedicated students in Peru. Sifu also travels to Chile to teach a single private Hung Gar student. A few of his student have moved to other countries, however, none of them currently teach. He has a small number of students because he tries to teach in the old-style. A lot of physical endurance, like holding the horse stance for an hour or more at a time. Students must go through the physical training for at least a year before he even begins to teach them Sil Lim Tao! He knows in today's world that's asking a lot. But he's fine with it, and only wants to teach the truly dedicated student who has the heart to learn. If they're not willing to do the hard work, he rather not teach them. He invests a lot into each of his students. The sad part is sifu Luis Ramos plans to stop teaching in 4 to 5 years, and with his commitment to teach only a small number of students, his lineage may not exist into the future. What Are the Seven Wing Chun Health Benefits?